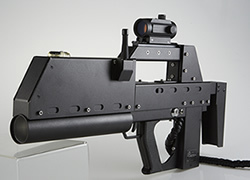 Battlefield Sports makes Laser Tag Guns for Business. These laser tag guns that are built tough. Click on each photo for specific info on each model, or download our full catalogue, click here. If you want to take the next step book a strategy session 1 on 1. 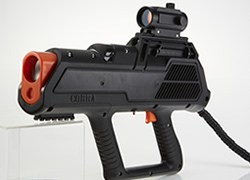 Cobra Phaser ** MOST POPULAR ** the most popular laser tag gun model. Polycarbonate case. P90 Personal defense weapon: great for the Battlefield LIVE / Milsim gaming theme. Metal case. 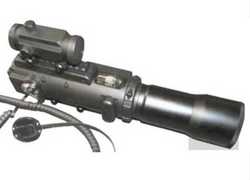 Honey Badger: AKA the HB14 is a carbine sized laser tag gun. Metal case. 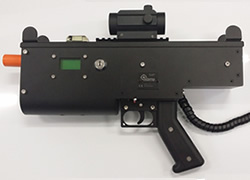 Blaster: light weight laser tag gun. Polycarbonate/metal hybrid case. 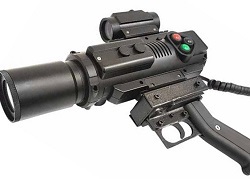 Spitfire: an evergreen favorite laser tag gun model (Uzi like). Metal case. Morita: Sniper Rifle or SAW configuration. Bring out the big guns! Metal case. SATRAIR: Airsoft or NERF accessory. Polycarbonate case. Used laser tag guns. Ask us about our selection of second hand laser tag guns. Scorpion: compact laser tag gun. Metal case. Ask Yourself - What Theme is Right for My Laser Tag Business? In our brand new live gaming platform, SATR3, there are 12 options. See our online catalog of our gaming guns and see what all the excitement is all about. Just hit my 6th month in business and wow I'm way ahead of anything I thought. Wow, we had our first long-distance guest - they drove 1 hour and 30 min just to play! How Many Laser Guns Do I Need? 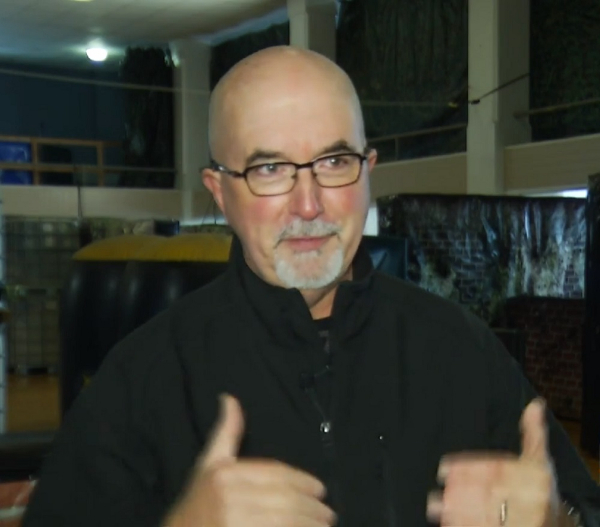 The number of laser tag guns used on a Battlefield LIVE battlefield varies. For a mobile laser tag outfit the minimum recommended number of gaming guns is 12. For an indoor laser tag arena or zombie haunted house the minimum recommended number of gaming guns is 24. And for an outdoor battlefield the minimum recommended number of gaming guns is 48. Very good feedback, very good support. The quality of the laser tag guns is amazing. This number varies with busier battlefields. In fact we limited the number of gamers per session on our local battlefields to 100 at a time. Not because the system cannot handle more gamers at once (the biggest game we've run to date was 436 gamers playing at once!) rather our car-parking only can handle that number of vehicles. What are the Laser Guns Made Of? 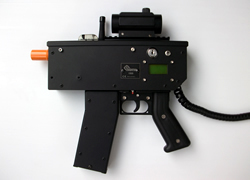 Laser Tag guns are made out of either aluminum or fiber re-enforced polycarbonate depending on the model. All come with 3 integrated infra-red sensors. All gaming guns have the predator muzzle flash. This is a light effect where 3 colored hyper-brights form a triangle shape and the infrared emitted is located in the center of the triangle. This muzzle light effect can be set, on boot up, to red, blue, while or no muzzle flash. LEDs are also in the head-sensor domes these flash when a gamer is hit, and the light remains on when the gamer is killed. Of course the gaming gun automatically stops working when a gamer is deactivated so the gamer returns to their base and presses the button on the medic box. The computer inside the medic box will re-spawn the gaming gun so the gamer can go back to the battle for a bit of pay-back. 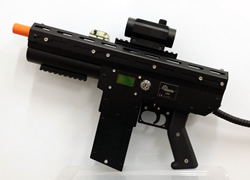 The quad core motherboard inside the gaming gun is the heart of the SATR system. This motherboard controls the gaming gun including the real-time hit-feedback. Basically when a gamer shoots an enemy his gaming gun will issue a sound effect such as "casualty" and when a gamer shoots an enemy and kills them, his gaming gun SFX will say "Kill Confirmed." This voice feedback is available in many languages. 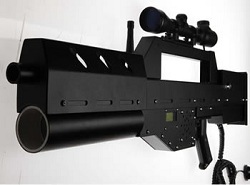 The gaming gun also comes fitted with a large marine grade speaker. And a LCD to display the status of the gaming gun to the gamer in real-time. For example the display will show the number of H for hits and K for Kills. If the current game is timed, then the display will also have a timer count-down so each gamer knows how much time is left to achieve their mission objective. This is a brilliant concept and desirable product. 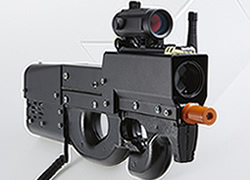 Unlike paintball guns or airsoft guns these laser tag guns shoot high-powered infrared "ghost bullets". These "gaming guns" work both indoors or outdoors. Our patented technology has more than 300 emulations. We make a variety of gaming gun cases, plus a master controller, a battle box (medic box) & a claymore. The electronics are the same in every case. So any unit can be configured to be any other unit within the SATR system. Think back over your life. There are probably 5 really memorable scenes you can remember. Our goal is to create an experience which is one of those handful of unforgettable times. That's why we believe in "every game, every gamer" - so no matter if you’re from a busy theme park, an established indoor laser tag arena, planning a mobile business, or simply a group of buddies wanting to set up your own private club, we believe that EVERY person who comes and plays at one of our battlefields should have a bodacious time. If you imagine, creating a business in your community that helps people build a “Wow!” experience. If you have ideas running round your head about all the scenarios you can create. If you are the kind of person who loves creating gaming experiences for your friends, your family, even for people you have even met yet! 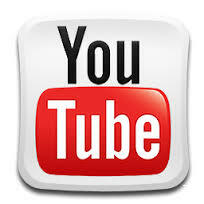 If you have a dream to build your own combat entertainment business. Then, do it for yourself. Included in your package, access to the online "Battlefield Sports University" which offers image library, marketing collateral, user guides etc. Check out the full list of Business Perks here. On trend: an intersection between video gaming and live gaming. Gaming has been around for thousands of years but in the last 20 years, three big movements, Paintball, Airsoft and Laser Tag have attracted millions of gamers. With Battlefield Sports you can experience the best of live gaming. Battlefield Sports is a top rated supplier of red hot equipment. The best thing i like is the ease of use, and fantastic back up. Read to take the next step? Book a strategy session 1 on 1. "The SATR programming is working great. We particularly like the Master Controller's ability to change gun classes and indoor/outdoor (since we do both). Our gamers really like the ability to randomize of the gaming guns with the Mystery Box. It enables us to change up a traditional game – keeping it fresh. We discovered that new mission moves everyone back to the original class and weapon setting – which was a brilliant programming decision! Thanks"